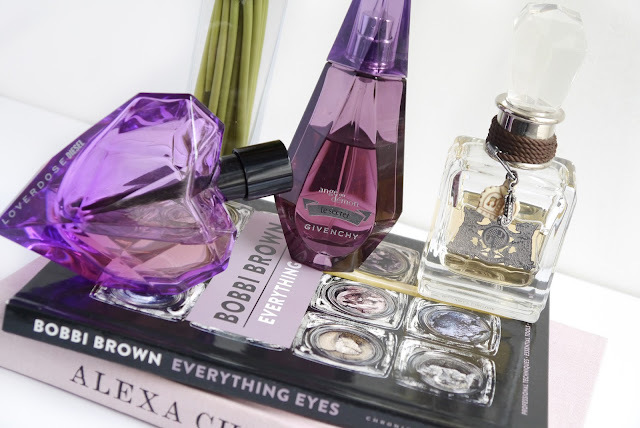 If I'm picky about something, it definitely has to be perfume. Whenever I find one that I really like I somehow manage to make it my signature scent for a long time. Some I wear them all year round, some I keep for this season. Si soy quisquillosa con algo, definitivamente es mi perfume. Cuando encuentro uno que de verdad me guste de alguna manera lo convierto en mi firma de aroma por un largo tiempo. Algunos los uso todo el año, otros los guardo para esta estación. My favorite perfume of all times has to be Loverdose by Diesel. It's a slightly strong sweet scent that I wear so much that all of my friends know it's Siham's scent. I like this one for every season because even though it's sweet, it still has a touch of fresh air to it. Before I had a major crush on Loverdose, my first love was the Juicy Couture perfume. I remember trying it on and how much it reminded me of dainty dolls for some reason. I love this one for fall/winter because of the strong scent, it never goes away and it's very sweet. Think of a warm chunky knit, this would be the perfume version. Last but not least, earlier this year I got Ange Ou Demon Le Secret by Givenchy. I find this one to be a kind of in-between season kind of scent. It's still a bit fruity and fresh but sweet enough to make it into Fall. The only downside is that the lasting power on this one isn't as strong as the previous two. Mi perfume favorito de todos los tiempos tiene que ser Loverdose de Diesel. Es un olor un poco fuerte que uso tanto que ya todos mis amigos saben que es el perfume de Siham. Me gusta usar este para cualquier temporada, ya que a pesar de ser dulce aún conserva un toque fresco en él. Antes de que me enamorara de Loverdose, mi primer amor fue el primer perfume Juicy Couture. Recuerdo el día que me lo probé y me recordó mucho a las muñecas delicadas por alguna razón. Adoro este para otoño/invierno por su aroma tan fuerte, jamás se desvanece y es muy dulce. Piensa en un suéter esponjoso, este sería la versión en perfume. Por último, en este año compré Ange Ou Demon Le Secret de Givenchy. Siento que este es un perfume para el tiempo entre temporadas. Aún conserva algo de olor frutal y fresco pero es lo suficientemente dulce para alcanzar el otoño. Lo único malo es su poder de duración, ya que no es tan fuerte como el de los otros dos que mencioné. What perfume do you like to wear for Fall? ¿Qué perfume les gusta usar para otoño?